Nottinghamshire force. The Norfolk men, along with Officers from several other constabularies, had been sent to Nottinghamshire to help deal with colliery riots that had broken out during a mining dispute in 1893. 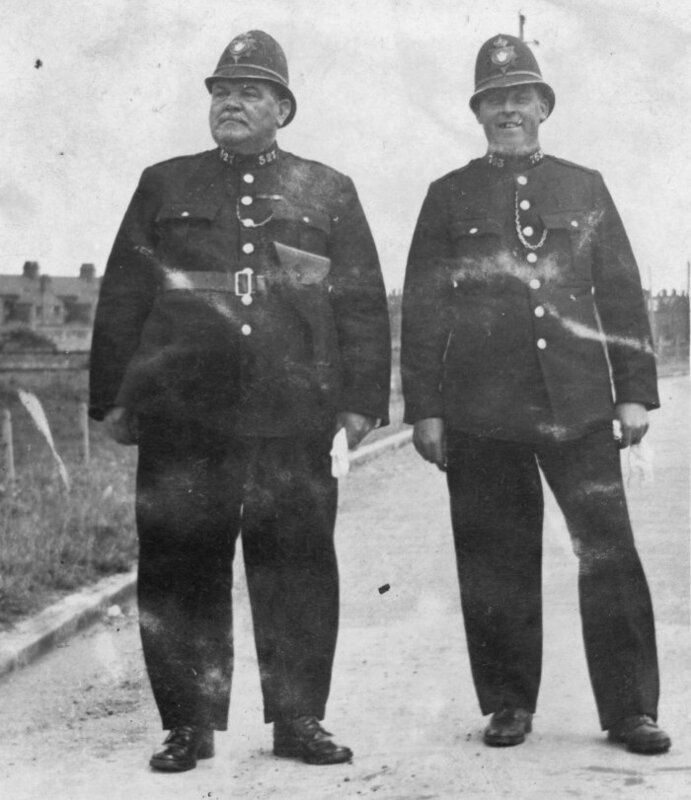 It is interesting to note the absence of badges on the helmets of the Norfolk men, while the Nottinghamshire Sergeant’s helmet has a distinctly more modern look to it because of its plate and rose top. 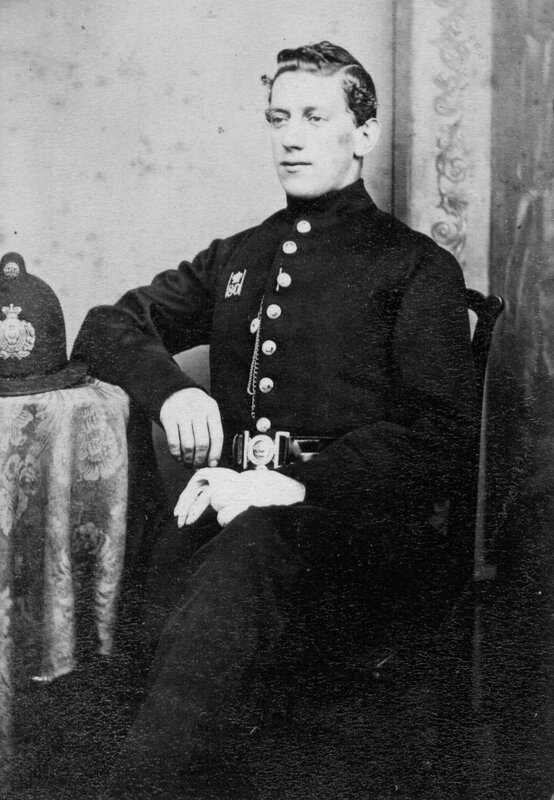 The Constable in the centre of the front row has a different tunic to his colleagues, with eight instead of five buttons, and has a very faded stripe, or something similar, on each arm above the wrist. 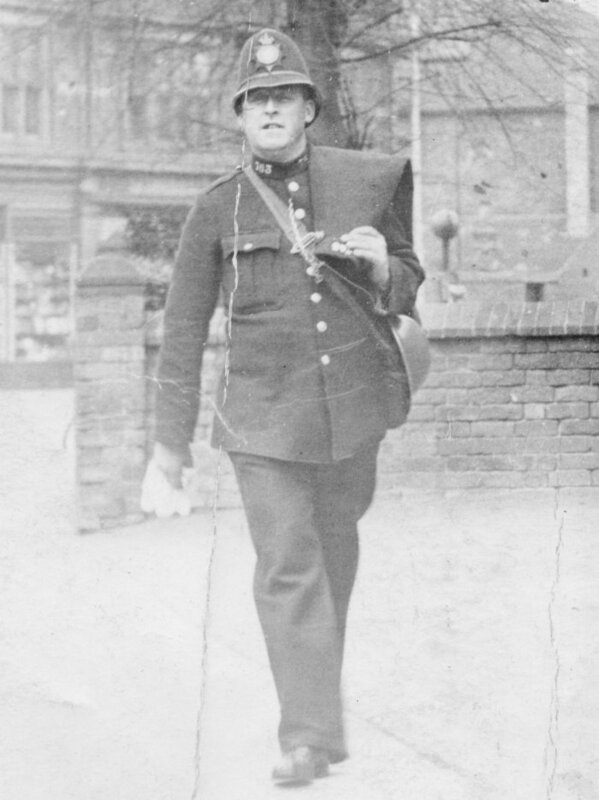 The above photograph shows Nottinghamshire Sergeant Arthur Clarke. He has no number because Nottinghamshire Constabulary did not give numbers to sergeants prior to amalgamation. 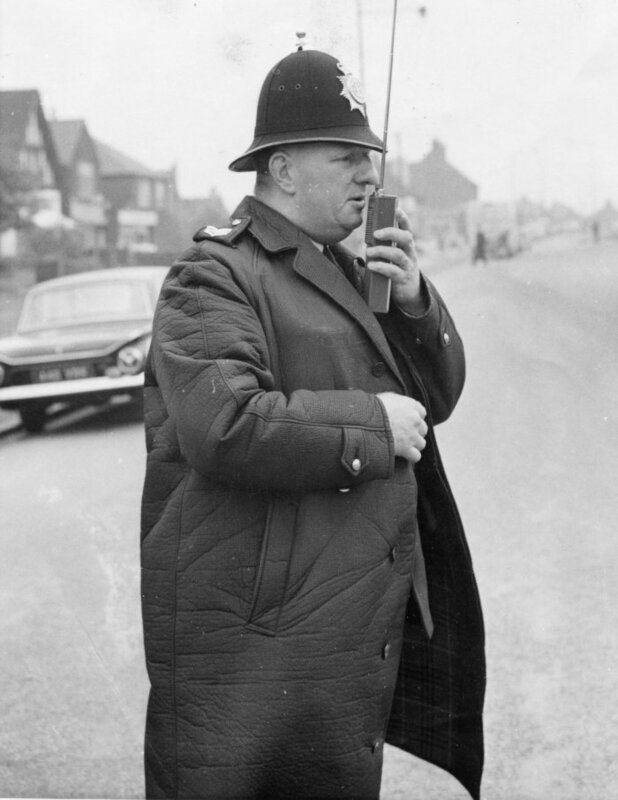 In 1965, Nottinghamshire Force used two styles of Gannex raincoats. One was heavyweight with plenty of style and the usual chrome buttons, but the lightweight Gannex was very plain and light for summer wear, and had no real style at all, as can be seen from the photo of Sergeant Clarke. It had black buttons that were hidden from view by an inset and the raincoat itself covered the buttons. The photograph was taken about 1964. 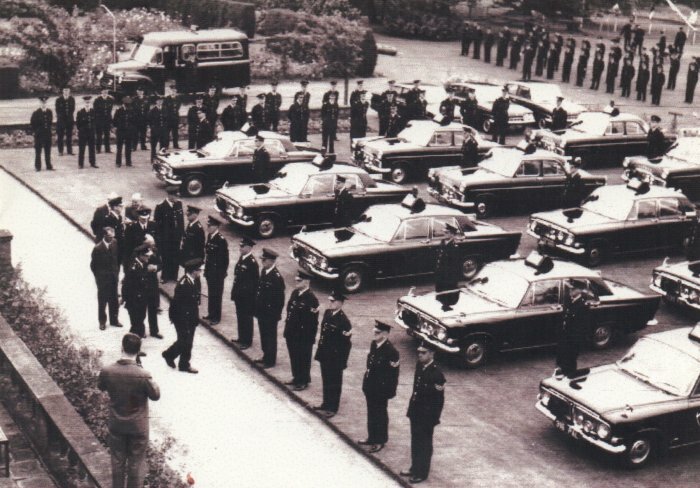 On amalgamation with the City of Nottingham Police in 1968 only the City officers wore collar dogs. Up until the introduction of this particular badge County officers only ever wore a King’s crown on the high-neck collars. 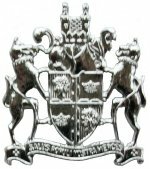 The Coat of Arms was originally introduced on Notts Combined helmet plates in 1968 and replaced in 1974 with the EIIR Notts Constabulary helmet plate. These collar dogs were issued to uniforms in 1979 and have been in use ever since. 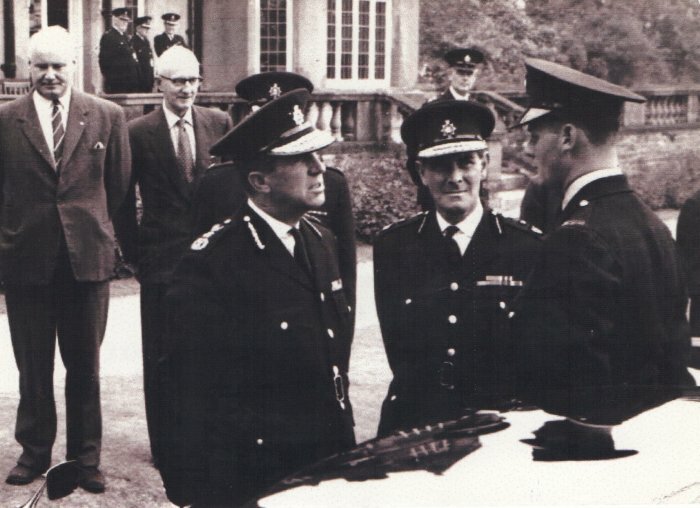 Nottinghamshire Constabulary Constables Stewart Mckenzie and Tony White receive their Queen's Gallantry Medals at Buckingham Palace, for the arrest of Donald Neilson (Black Panther), in which Neilson had held them at gunpoint and put up a violent struggle, 1977.